Put it on your calendar to join us 3:00 pm EST 12/24 to 3:00 am EST 12/25. Ask @GeorgeTheDuck if you need him to translate that to your time zone for you. ALL pals and friendly others are welcome. We’ve had atheist pals, Jewish pals, agnostic pals, and Christian pals come play with us, and other religions are welcome too. We just don’t want anypal to have to sit home alone on #CatmasEve. If you want to get involved as a volunteer, speak with @georgetheduck on Twitter about DJing, Barktending, Quizzing, Graphics, Sekurity. He’ll direct you to the pal that is heading up that festivity. And as always for #CatmasEve, our charity is Black Cat Rescue. Please drop them a small donation. Every single dollar helps. See you back here on #CatmasEve! Posted by George & The HotMBC Cats. Categories: Uncategorized. 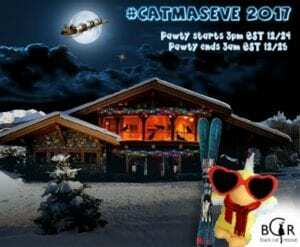 Comments Off on #CatmasEve 2017 is coming!